So far in this series, we’ve covered themes and protagonists. This post is to help our Triathletes get a little insight into crafting the perfect villain for their P.A.R.T.Y. in a Box skits to help the first two items really shine. In short, an antagonist is the “bad guy” in a story. This person, group, or organization has goals that are directly at odds with the goals of the protagonist. They more than likely create the problem that the protagonist faces because they exhibit negative traits such as greed and selfishness. This could be a shady government, a mad scientist, or the “popular” kids at school. Sometimes, an antagonist has nothing to do with creating the problem, but they don’t want to see it solved, either. For instance, in The Little Mermaid, the main conflict is that the Ariel longs to enter a world that is out of her reach. She goes to a witch and asks for legs, and Ursula gives her what she wants. 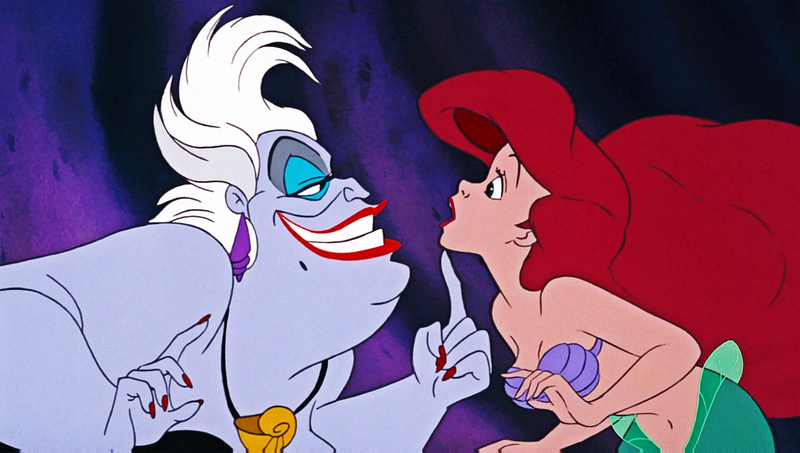 Ursula didn’t create Ariel’s longing and actually accommodates the protagonist so she can go on her quest. But by the end, Ursula does have goals that contradict the protagonist in order to accomplish her own selfish ends. This series addressed the concept of protagonist first, but that doesn’t mean every story idea has to start with the hero. The most important thing about an antagonist is that they are the opposite of the protagonist. It can sometimes be easier to work from the conflict backwards and figure out who will resolve it. In the past decade, there has been a rise in the number of nuanced antagonists in film and television, as well as attempts to soften classic villains through adding a sympathetic backstory (e.g. Maleficent, The Phantom Menace). For many, this felt like a total affront to their concepts of good and evil, and these films have gotten a lot of heat from fans of the originals. To borrow a term from author Leanna Renee Hieber, there are fewer “Shakespearean villains” nowadays, meaning the over-the-top, unequivocally evil ones. Over the course of a film or series, it is much easier to explore the different sides to every story. But in a five-minute skit, it’s going to be much harder to give them this sort of treatment. When it comes to P.A.R.T.Y. in a Box antagonists, the easier it is to spot them (and so the conflict), the better. Our Triathletes have very little time and limited resources at their disposal to help the audience identify who to root for. In this case, the more Shakespearean, the better! Give your villain an evil laugh, purely selfish motive, and world-ending laser, and the judges will thank you. The easier it is for them to identify your characters and conflicts, the easier it will be for them to understand the message of the story. Remember, the theme section of the scoring guidelines has the potential for the most points in the event, and the characters are there first and foremost to explore that theme.